Chestnut shells are brown with a round shape, coming to a point at the top. The nuts are round, white and usually less than one inch in diameter. 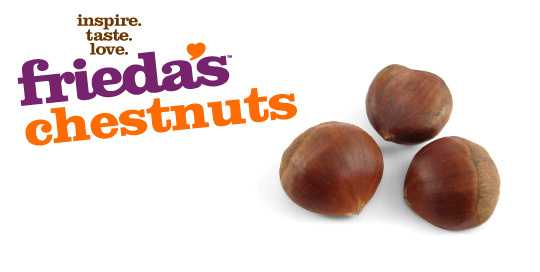 Chestnuts have a subtle sweet flavor and creamy texture. To peel: slit shells and boil, roast or bake for 20 minutes. Use whole, chopped, pureed, or mashed in stuffing, puddings, desserts, soups, or served with root vegetables. Good source of dietary fiber and rich in vitamin C.
Choose firm nuts with no soft spots, splitting, or mold. Keep at room temperature or refrigerate for up to 2 weeks.